British artist David Hockney saw the potential of the iPhone two years ago and set immediately drawing. He’s become fond of brushing his thumb against the screen to draw flowers, which he often sends to friends for a morning surprise. “And my flowers last!” he’s notorious for saying in interviews. Last year Hockney created 300 paintings on his iPhone, even putting some of his pieces on exhibit, but now that he’s familiarized himself with the iPad he has bigger plans for the larger screen. “The iPad is many things, but one is a very useful new visual tool,” Hockney told Britain’s Times newspaper. “I see the iPad as a wonderful new drawing medium, but I am at a loss as to how to make it pay,” he said. Whether the iPad becomes a revenue tool or not, Hockney has already set to drawing. When he discovered that the iPad could record his brushstrokes on the screen he told the public to ready themselves for live exhibits. 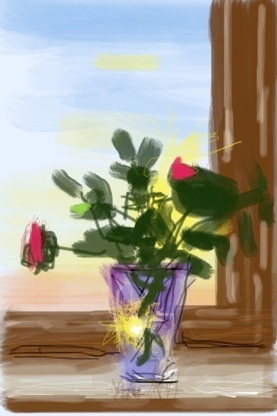 Until then you can look for Hockney’s iPad sketches as they pop up on the internet. His suits have already been made with oversize pockets so he could carry his sketch books so he can already bring his 21st century easel everywhere he goes.